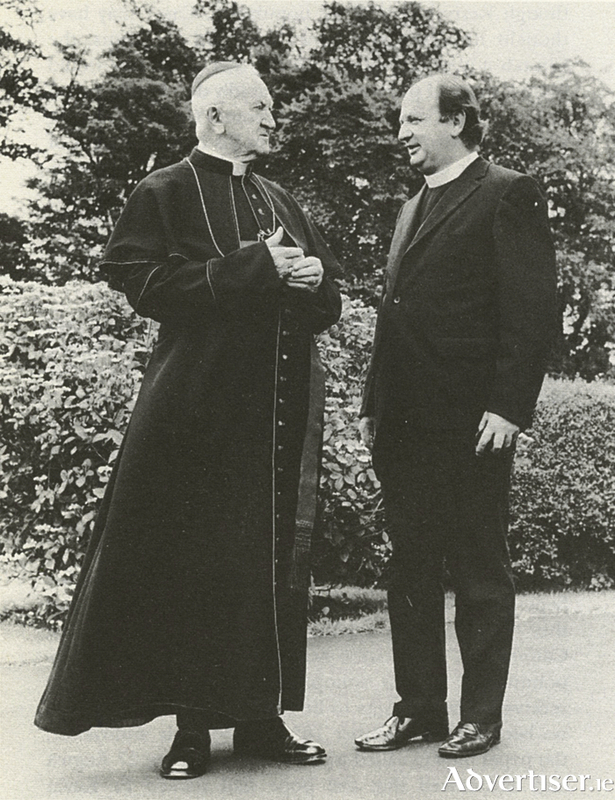 The old confronting the new: Bishop Michael Browne meets Bishop Eamonn Casey for the first time. On Sunday September 19 1976 the former bishop of Kerry, Eamonn Casey, succeeded to the See of Galway. He had been appointed some months beforehand, but was delayed by his long goodbye tour of Kerry. The people of Kerry were heartbroken to lose him. Initially Galway was not sure how to take Bishop Casey. He was certainly a breath of fresh air, but people were so intimidated by Browne, we were almost afraid to breathe. Casey had no such difficulty. He quickly identified the social needs within the growing city, and launched himself into action. Helping the defenceless was to become his credo. He reorganised ‘Meals of Wheels’ for the housebound. He visited every parish church and spoke to the people asking them to help to make his mission to Galway diocese a success. He embarked on an ambitious church building programme to meet the needs of our spreading suburbia. The Catholic Church heirarchy set up Trócaire, a Third World development agency, with Casey as its energetic front man. Its first Lentan Appeal raised a staggering £1.25 million. Young people quickly found his openess attractive. Every year he organised a retreat for all Leaving Cert pupils, and engaged them about the world at their feet, and the dignity of their lives. He made confirmations special by his inclusive sermons, and smiley photographs with all the parents. He set up a refuge for ‘battered wives’ in Woodquay, ensuring that each family would have its own accommodation and privacy. He established a branch of Cura to help pregnant girls who found themselves alone and without support. Of course we were all to learn later that he had insisted that his girlfriend Annie should give their son Peter up for adoption. And how deeply upset Annie Murphy was at his insistence. Maybe, because he had seen how vehemently Annie had held on to her son, that he had learned a lesson. He agreed to be chairman of Cherish, another organisation to help single mothers, at a time in Ireland, where, regretfully, single mothers were still sniffed at. A group known as Family Solidarity picketed their Dublin meetings. He was frequently on the Late Late Show. He was always a popular guest. Casey was not a born theologian; he argued from his heart. Gay Byrne enjoyed teasing out his Catholic views. But Casey would always win applause when he condemned the Irish rugby tour of South Africa, or scourging the Government for its lack of commitment to the Third World. He would speak with emotion on the problems of unmarried mothers, emigrants, and the poverty of priests in Galway (whom he set all on a living wage ); and would end each appearance singing The Rose of Tralee, or some such song, the audience singing along. We all listened and sometimes laughed out loud at his infectious voice, sense of fun and enthusiasm. He was doing a lot of good for the church, which was seen to be rigid and unbending at the time; and he was doing a lot of good in Galway. Sensationally he played master of ceremonies during the spectacular Youth Mass for Pope John Paul II at Ballybrit, in the autumn of 1979. He stood beside the pope as they were driven through the crowds on the pope-mobile. We get a glimpse of Casey’s struggle between what he knew from his pastoral work and the Church’s teaching, when during the first divorce referendum in June 1986, he gave an extended interview to Hot Press. It seemed to the interviewer that Casey was on the verge of tears. But he pulled himself together, and the interview continued. But I think the time that Galway finally came to love Casey was when in December 1986 he was returning from a dinner with friends in London and inadvertently drove past a police car at speed. Naturally the patrolling officers took a dim view of this. Casey found himself up before a magistrate who fined him £200. Evidence was given that he had twice the amount of alcohol legally permitted. He was immediately forgiven. People crossed the road to shake his hand. The people were happy to have a sinner, just like ourselves, living among us. He became, perhaps dangerously, a bit of a hero. NOTES: *Bishop Browne was an anathma even in his day. He signed his name with a cross, and then ‘Michael’. He was known as ‘Cross Michael’. He was very conservative, and controversial in his interpretation of Catholic doctrine. He was not kind to many of his priests. Incredibly today, he insisted that men and women should bathe seperately in Salthill. He supervised the construction of Galway cathedral, which contains some very fine stained glass. **He offered the so-called ‘Bishop’s Field’ which stretched from Taylor’s Hill to Lr Salthill, as a site, but neighbours warned him off. It is now a successful traveller site; with all children there attending school. For this week’s Diary I am leaning on Fall from Grace - The Life of Eamonn Casey by Joe Broderick, published by Brandon, 1992.